The US Air Force has released the first images of its latest combat drone, the XQ-58A Valkyrie. The new aircraft, which went from concept to first test flight in 2.5 years, “behaved as expected” on its first test flight this week, according to the Air Force. The 76-minute inaugural flight occurred on 5 March 2019 at Yuma Proving Grounds in Arizona. The Air Force released a short 15-second video of the first flight to show it off, something that the military doesn’t do with all of its aircraft. The drone was developed for the Air Force Research Laboratory’s (AFRL) Low Cost Attritable Aircraft Technology (LCAAT) program which seeks to develop new planes for the military both quickly and inexpensively. 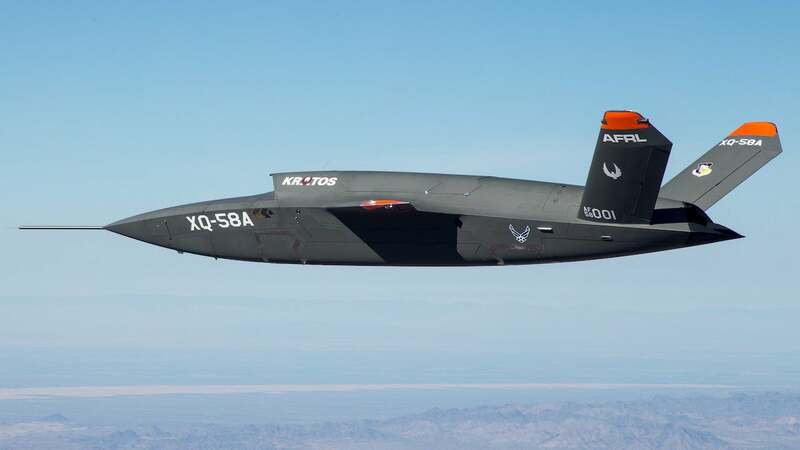 “XQ-58A is the first example of a class of UAV that is defined by low procurement and operating costs while providing game changing combat capability,” Doug Szczublewski, AFRL’s XQ-58A Program Manager, said in a statement. The XQ-58A drone reportedly has a range of “well over” 3200km and can carry both precision-guided bombs and surveillance equipment. As Tyler Rogoway at The Drive notes, the new drone is specially suited to operate at the direction of manned planes nearby under a concept the Air Force calls its “loyal wingman” program. Theoretically, a piloted fighter jet could travel alongside a number of these unpiloted Valkyries, which would assist by doing everything from jamming enemy radar to firing on a target. Rogoway also notes that the finished drone looks remarkably like the earliest concept renderings that were released by its developer, the San Diego-based military contractor Kratos Defence. Kratos is on the forefront of the latest weapons technologies, having recently developed the AN/SEQ-3 Laser Weapon System system for the US Navy. Laser weapons, which fall into the category of “directed-energy weapons”, are being shown off by America’s New Cold War adversary Russia with increased frequency. The cost of the XQ-58A Valkyrie program wasn’t released publicly, but the best estimates put the budget at roughly $US2-3 million ($2.8-4.3 million) per plane.